Bespoked, the UK’s Handmade Bicycle Show is Britain’s biggest annual showcase for custom bike builders. 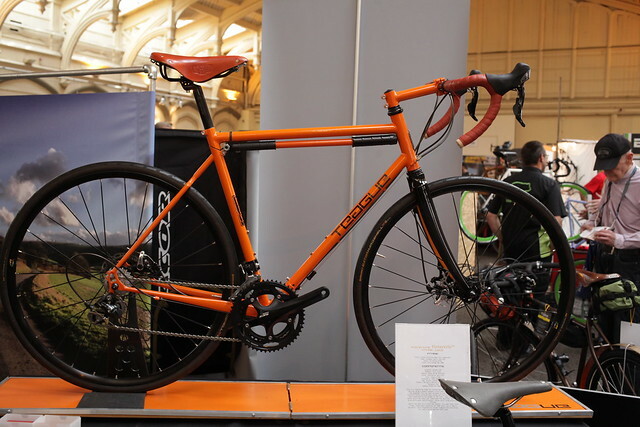 It’s full to the rafters of beautiful bikes but Jack Thurston went in search of the most useful bikes at the show, from an off-road porteur to a separable road bike to a childback tandem in titanium. To many UK cycling campaigners, David Hembrow is a Moses-type figure, handing down tablets of smooth, car-free red asphalt from the streets of Assen in the Netherlands where he lives and writes the blog A View from the Cycle Path. He’s also a controversial figure, arguing that separation of cars and bikes is essential for mass cycling and that many UK campaigners are either on the wrong track or suffering from hopelessly low expectations. In an extended interview David explains why he moved from England to the Netherlands in search of cycling nirvana and what the Dutch have got to teach the rest of the world when it comes to making cycling friendly towns and cities. Contemporary bike culture is blossoming into a mesmerising kaleidoscope of bicycle-related art, craft and graphic design. Small artisans are leading the way while big brands try to cash in on the action. Alice Marsh of Bike V Design leads a discussion recorded in front of a live audience at the Victoria and Albert Museum, bringing together a panel that includes Tom Donhou, a former product designer turned bicycle frame-builder, the founders of The Ride Journal and Boneshaker magazine and James Greig, a graphic designer and author of the Cycle Love blog. This conversation was recorded live at last month’s Bike V Design night at the Design Museum.